Visit the official website to fill the form. Candidates have to click on the "Admission" tab which is on the Home Page of the official website to fetch the application form. 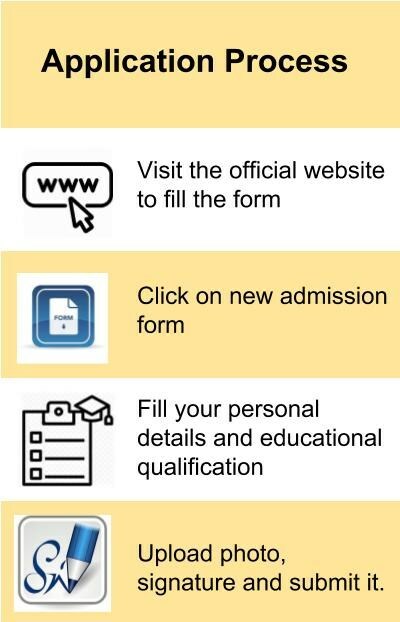 Candidates have to click "New Admission Form"
Candidates must log in with their User_Id to open the application form. The candidates should fill the application form as directed. Candidates must select the course, course type, department. Candidates must fill in their Personal Information. Candidates should fill their Educational Qualification carefully in the application form. Upload the photo &signature and submit it. 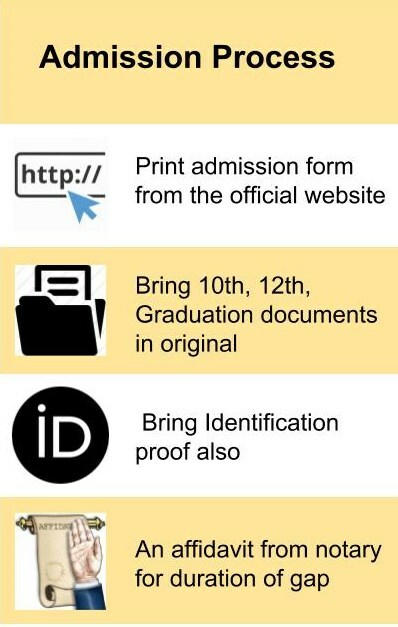 Print out the admission form from the official website. Allotment letter /DVN and provisional letter generated from JOSSA Website. JEE score card and admit card in original. 10th & 12th marksheet / certificate in original. Transfer, Migration and Character certificate in original. Candidate belonging to SC / ST / OBC / Disable category must bring the proof of belonging to the category. If there is a gap between joining the course an affidavit from notary for duration of gap. Identification proof issued by Government Agency. Allotment letter / DVN and Provisional letter generated from NIMCET website. NIMCET score card & admit card in original. 10th, 12th, Graduation (All Semesters) marksheet / certificate in original. Allotment letter / DVN and Provisional letter generated from CCMT website. Valid GATE 2019 score card and admit card in original. M.Tech and M.Plan admission will be based on the basis of GATE score. Final year student can also apply. The candidates who have completed 10+2 with Physics and Mathematics as compulsory subjects and Chemistry/ Biology/ and Bio-Technology as optional subjects are eligible to apply for the B.Tech course in Maulana Azad National Institute of Technology, Bhopal admissions 2019. Admission to B.Tech / B.Arch / B.Plan courses will be done on the basis of JEE Main 2019 scores. Candidates who have completed 10+2 with Mathematics as a subject are eligible to apply for B.Arch and B.Plan courses. Placements: The placements are too good. In CSE, ECE and mechanical branch, the placements are very good, and others branches placements are almost good. I can say that all the students who are interested in the private job and wants to achieve a top placement can apply for this institute. Infrastructure: New hostels have fine facilities such as living rooms, sports, games, classrooms, and labs are in good condition. All the materials are provided in labs and library. All over infrastructure is average in condition. The Wi-Fi speed is good in old hostels. In new hostels, the Wi-Fi facility is not provided. Otherwise, all facilities are good rather than old hostels. Faculty: The teaching quality is average. The faculty is disciplined, and they are punctual. Exams pattern and question paper level is not good, but helpful to get knowledge. All courses are provided and are having fine facilities. Knowledge level can increase by the material which is provided in this institute. Other: All events, fest, pro nights are very enjoyable. Events and activities take place time to time. There are so many things to recognize talent and show that. The entrance exam for getting MANIT is JEE mains and eligibility is according to the exam only. Usually, 200+ out of 360 is an assuring score for getting your desired stream in MANIT. In older days it was called AIEEE. The admission procedure takes place between June and August at Maulana Azad National Institute of Technology, [MANIT] Bhopal. The Eligibility for MANIT is the completion of higher secondary with 75%. The Admission for MANIT is to Appear for the JEE Main Examination conducted by CBSE and secure good rank to get the desired branch of engineering in MANIT. The cutoff for the admissions to SBMJC is to get 22482 out of the total(gen) and 38580 out of the total(OBC). The eligibility criteria for admission in Maulana Azad National Institute of Technology, [MANIT] Bhopal is to pass 2 years of intermediate. For admission, one should write JEE MAIN examination conducted by the central government. Based on the rank you get in JEE MAIN one should apply for the counseling. If we get seats in counseling then he is eligible to take admission in our college. The cutoff rank for getting admission depends upon the branch you choose and also on the cast the cutoff also changes frequently. In 2009 one has to appear for AIEEE to get into NITs. A rank below 20000 will get you entry into one of these prestigious universities which have been declared as Universities of National Importance. One has to have min. 60% marks in 12th Board with PCM combination can easily get Maulana Azad National Institute of Technology. The eligibility criteria for getting selected in NIT Bhopal is to get a good rank of about 15000 maximum for general category. The entrance examination in which the above rank is required to take admission in NIT Bhopal is JEE MAIN. The typical cutoff for the above exam is 120 marks. I appeared for JEE Main examination to get admission in Maulana Azad National Institute of Technology and got approximately 20,000 rank (GEN). As I am an OBC student, l was easily selected. Eligibility criteria for getting admission in Maulana Azad National Institute of Technology is through B.tech in any stream. GATE entrance exam is required for getting admission into this college. Eligibility criteria for students to admit is they must graduate with 60% and the procedure is you have to clear NIMCET entrance exam after clearing NIMCET You will be able to take admission in MANIT BHOPAL. Students eligible for this institute should have passed or appeared in 12th with PCM. For admission, candidates have to face JEE MAINS competitive exam. General cutoff for admission in such institute is above 100 marks. I have qualified jee mains exam conducted in April 2014 to get admission in Maulana Azad National Institute of Technology. I scored 191 out of 360 with AIR 13597. Eligibility criteria were 12th and exam applied was JEE mains. I also took the same exam. cutoff varies for different colleges for my college it was 160 and overall Cuttoff was 81. The eligibility criteria for students completing their board exams outside of India was above 60 percentile in 12th boards. Entrance exams were SATs for NRI students Above 1600 on the SATs. The eligibility criteria are 12th standard pass outs. Admission procedure is through JEE MAIN entrance examination. Cutoffs depend on the category of the student and branch of the course. The eligibility criteria are that your +2 score should be more than 90 percentage. JEE MAIN entrance examination cutoff is about 170 marks. The applicant needs to take jee mains and secure at least 75% marks ( 65% sc/st ) in the 12th exams at Maulana Azad National Institute of Technology. The eligibility criteria for getting admission in Maulana Azad National Institute of Technology is clearing the JEE MAIN exam with 180/390 marks. To get admission in this college, the candidate must clear the JEE MAIN exam and must have passed the 12th from a recognized institute. Cut off rank for open category is 4000. Candidate must clear the JEE MAIN exam and must have passed the 12th from the recognized institute to get admission in this college.The cutoff rank must be below 40,000. The student must be 12th passed. And the minimum age of 17 years. CSE typical cutoff in MANIT GEN - (150-190)/360. Admissions at Maulana Azad National Institute of Technology are based on the JEE scores. You must 12th pass with min 75% or 20 percentile in state board. JEE MAIN 35000 rank in JEE MAIN. 60 percent in graduation like BSC, BCA, BCom, BA and NIMCET rank basis admission in an entrance. 1. Print out of the Admission Form 2. CAT /GMAT Score Card & Admit card 3. 10 th & 12 th Marksheet/Certificate (must be original) 4. Graduation Marksheet/Certificates (All Semesters) (must be original) 5. Transfer & Migration certificate (must be original) 6. For candidate belonging to SC/ST/OBC/Disable category, proof of belonging to the category (the original permanent caste certificate) signed by S.D.O/Competent authority with proper reference number and official stamp. 7. OBC candidates are advised to produce the Certificate for Admission to Central Educational Institutions (CEIs) under the Government of India issued after 1 st April 2016. 8. Students who are appearing in the final year of graduation are required to bring appearing certificate from their Institute. 9. If there is a gap between graduation and joining the course an affidavit from notary for duration of gap is required. 10.Any Identification card i.e PAN, Driving Licence, Aadhar card,etc 11.All documents/ certificates in original and two sets photocopies with 4 passport size photographs.